This is part one of a two part blog post on the 3 E’s and 4 R’s for gut health. This is your road map to dramatically improve your gut microbiome. And when added together, this represents about 100 trillion microscopic organisms. This means that 10% of your cells contain human DNA. The remaining 90% of your cells are some combination of bacteria, fungi, and microflora. To help you better understand this, let’s talk about DNA or “genes” which are the building blocks of life. Genes carry the genetic instructions that shape and form every living thing. There are 22,000 genes in the entire human genome. There are 3.3 million (3,300,000) genes just in the human gut mircobiome. This diversity in the gut microbiome is huge and plays a significant role in determining your overall health and wellness. And to effectively restore your gut health, so that you can live a vibrant life, you need a road map. What we call the 3 E’s and 4 R’s for Gut Health. In this blog post we’re gong to focus on understanding the 3 E’s. We’ll address the 4 R’s in my next post..
Let’s start by addressing the first E which is Eliminate Dysbiosis. What this term means is that your delicate microbial communities have become disrupted and imbalanced, which can lead to poor health. And one of the major causes of dysbiosis is the use of antibiotics and pharmaceutical drugs. As the National Institute of Health points out in their article Antibiotics and the Human Gut Microbiome: Dysbioses and Accumulation of Resistances, the human microbiome has been overly exposed to antibiotics from both the medical community and food industry. As your gut microbiome is overpopulated with bacteria that produce toxins, the following sequence begins to happen. Toxins are produce that cause inflammation of the gut. Not only can this cause abdominal distress, but it leads to a condition called Leaky Gut, which we’ll talk about next. Toxins enter the blood stream either by attaching themselves to fat molecules or enter due to a leaky gut. These toxins create inflammation throughout the body. Inflammation can lead to Metabolic Dysfunction. Metabolic Dysfunction leads to Insulin Resistance. Fat Deposition leads to Cardio Metabolic Dysfunction. Plus the toxins that enter your blood stream can have tremendous impact on key tissue and organ systems, especially your muscle tissue, fat storage, liver function, and cognitive impairment. So, the key to solving the toxin issue is to recolonize the mircobiome of the gut to those microbial communities that support good health. This means: Fix the Gut You Fix the Problem! And one big problem for most people is having a leaky gut. While the medical community does not recognize this as a major contributing factor to all sorts of health issues, there is a growing body of science showing how a leaky gut, or what is called intestinal permeability, is wreaking havoc on people’s health. Ideally, your intestine is designed to be a very selective barrier to everything you consume. 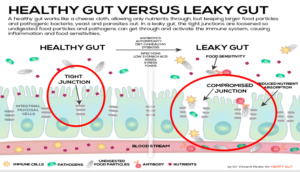 It does this by creating what are known as “tight junctions.” As you can see in the image created by Dr. Vincent Pedre for Happy Gut, these tight junctions are loosened so that undigested food particles, toxins, and pathogens can enter your blood stream. The result is an immediate activation of your immune system causing inflammation and food sensitivities. While not everyone has this, our Leaky Gut Survey will help you understand your increased probability for this issue. There are two columns: Triggers and Symptoms. The more you check off, the more likely you are to have some level of leaky gut. While most people think they eat “good” food, let’s identify three triggers from our Leaky Gut Survey that most people consume and how they can contribute to a leaky gut. Lectins – Lectins are sugar-binding proteins used by plants as a natural defense system to protect themselves from mold and parasites. And while they protect plants, they damage your intestinal lining. The reason why is your digestive lining is covered with sugar-containing cells that help break down your food. These lectins will attach themselves to your digestive lining causing inflammation that ends up damaging your gut. And while there are a wide variety of foods that contain lectins, these 4 will have the greatest impact: Wheat, Legumes (especially kidney beans), Peanuts, and Soy. Dairy Protein – Conventional cow’s milk contains the protein A1 casein which is harmful to your gut. This is especially true if you’re drinking pasteurized milk which destroys vital enzymes that are needed to help you digest sugars like lactose. The best alternative to dairy is to replace it with Almond Milk, preferably 30 calories without any sugar added to it. Sugar – Outside of wheat, this is the number one contributor to poor digestive health. And the reason why is that sugar feeds yeast, candida, and bad bacteria. All of which can create toxins that damage the lining of your intestine. And the greater the dysbiosis of your abdominal cavity the greater your potential for a leaky gut. So how do you correct this dysbiosis and potential for a leaky gut? And the resulting inflammation that occurs? 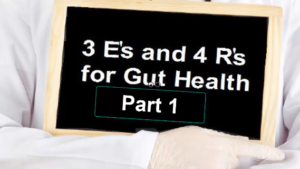 We’ll cover these 4 R’s in part two of our series on The 3 E’s and 4 R’s for Gut Health. Remember if you Fix the Gut and You Fix the Problem!